Never mind scissors. When you want to change up the look of your hair, nothing gets the job done faster than playing with its texture. Our new Texture Tonic can easily transform your tresses from smooth to wavy—sans crunchy residue, thanks to a sugar-and-salt combo that doesn’t form a dull, mattifying film on hair like traditional beach sprays. Allen Ruiz, Aveda Global Artistic Director, Hair Styling recommends scrunching the tonic into newly dried hair in place of hair spray for definition and texture. Or, use it on wet hair for added volume and movement once dry. Apply Be Curly™ Style-Prep™ to your clean, damp hair, from roots to ends. Then, use a comb to divide your hair into small sections. 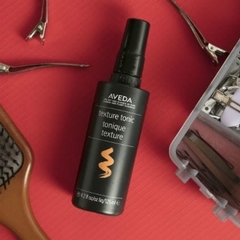 Spray Texture Tonic from mid-lengths to ends of a section, then use your fingers to twist the section. Repeat until all your hair is twisted in sections. Blow-dry twists using a diffuser, then spray Be Curly™ Curl Enhancing Hair Spray over the top of your head to lock in waves. Spray Pure Abundance™ Style-Prep™ on your clean, damp hair, from roots to ends. Blow-dry using the Aveda Wooden Paddle Brush. Divide your hair into sections and spray a section with Texture Tonic from mid-lengths to ends. Roll a section up to the root in a roller and pin. Repeat until all sections of hair are pinned in rollers. Spray Air Control™ Light Hold Hair Spray over the top of your head. Undo rollers, then use your fingers to gently separate your waves. Spray Pure Abundance™ Style-Prep™ on your clean, damp hair, from roots to ends. Blow-dry hair in sections, using a round brush. Twist hair as you unwrap it from the brush to create waves. Puff Shampure™ Dry Shampoo into hair from mid-lengths to ends, then spray Texture Tonic through mid-lengths and ends. Scrunch ends with your fingers for an undone look. ARE YOU LOVING THE NEW TEXTURE TONIC?